Dan Deacon performs on the mainstage of Treefort Music Fest 2013. Festival director Eric Gilbert says Wednesday morning's announcement is almost all about emerging and regional bands. Besides music industry favorites Built To Spill, less well-known Boise groups like Hollow Wood and Magic Sword are on the list. But there is one out-of-town headlining act on this list. It's Brooklyn-based Run The Jewels, and they've been making waves in the underground hip-hop scene since they announced their collaboration in April. Gilbert says more headliners will be on the next list, which will likely be released in January. Gilbert says the list also includes some music from across the pond. London bands The Joy Formidable and Breton are two groups Gilbert's looking forward to seeing perform. Gilbert says a month after last year's festival, organizers had already started to talk with agents about booking for next year. But Gilbert says it's still early in the year for many bands to be making tour decisions, and there are some limitations with being a small independent festival. As promised, Animal Collective will play in Boise. The experimental musicians were scheduled to headline this year’s Treefort Music Fest. But when the band's lead member came down with a bad case of strep throat, the group canceled its spring tour – including their visit to Boise. How Will Treefort Music Fest Manage Growth? 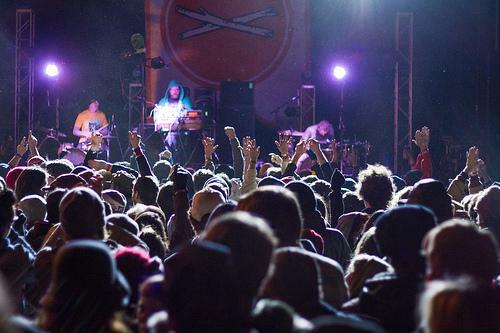 Boise’s Treefort Music Fest made some big strides in its second year. A month after the festival wrapped up, organizers say the festival grew more than was previously thought.